First off, I’d like to thank The Daily Post for writing a whole post about the different blog events going on and providing useful links to them! 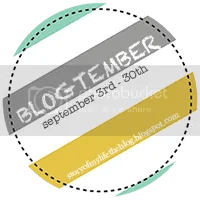 It was thanks to that post I found the Blogtember Challenge on the blog Story of My Life and thought, why not?! Unfortunately, I found this post a few days after it started and decided I’d just do one LARGE catch-up on everything I’ve missed! 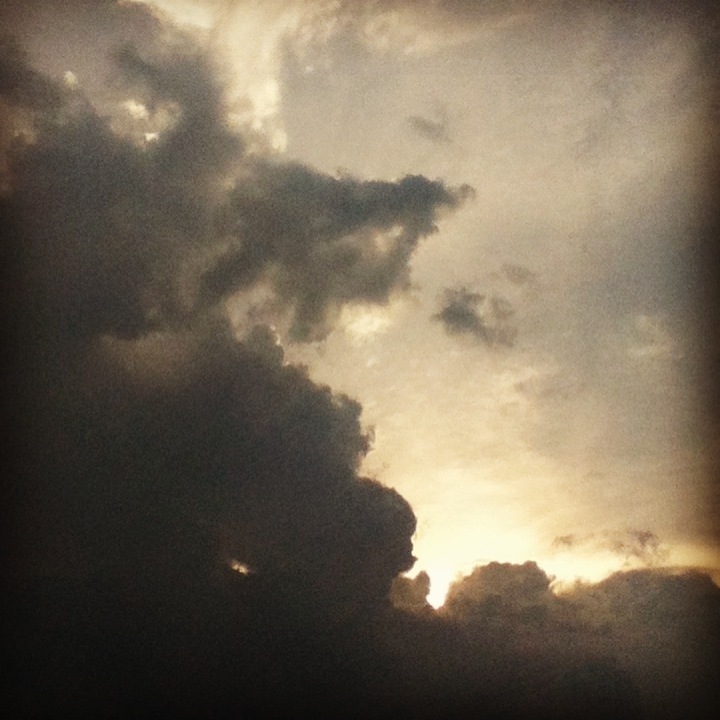 September 3, 2013 – Describe where or what you come from. Deep red and elegant, standing tall and proud. I am from the Carousel Theater and sliding into third base, breaking my ankle. From Diamond and the beach. And everyone saying, SHUT UP! When they are excited. I’m from Wonder Woman and Hermione. I’m from pickles and olives. I’m from my mom, my dad, and my grandparents. I’m from stardom and a singing career. I would travel to all the places I’ve only been once and to all the places I’ve always dreamed of seeing – the latter list includes England, Scotland, Italy, Australia, South America, the list is endless! I love to fly and travel! Life is an ADVENTURE! September 5, 2013 – Pass on some useful advice or information you learned and always remembered. September 6, 2013 – A story about a time you were very afraid. I’m not really sure what story to share…. my Not So Sweet 16th Birthday comes to mind…. Then there was the time I was caught in a terrible thunderstorm at Disney’s Hollywood Studios. Phew, now that I’m all caught up, fingers crossed I wont get behind again! It appeared to be a typical Wednesday at the office until we noticed the morning sky getting darker instead of light. The mood out on the street was eerie, my boss (jokingly I hope) described the scene as that of a Stephen King movie (to this day I’ve only seen one of his movies and that was not by choice). We waited but nothing happened. No rain. No wind. No lightning. Just as quickly as it got dark, the sky cleared and we saw this mystical object in the sky. If I remember correctly it’s called the sun (insert angelic choir). Great. 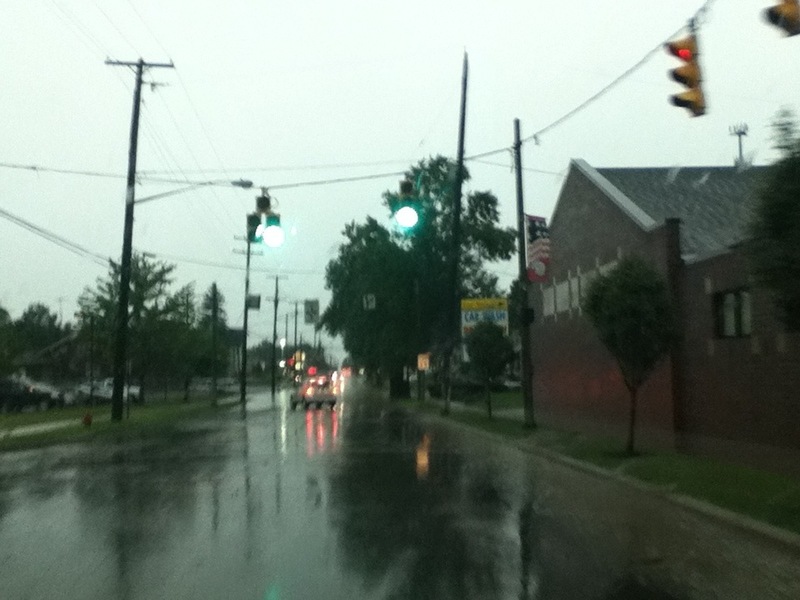 Here it is 2:45PM, pouring down cats and dogs, I get off work in 15 minutes and I’m going to have to go out in this! Apparently my mental complaining got through to the higher powers because by the time I clocked out, it had magical stopped raining ad then just as magically started to pour 5 minutes later when I got to my dentist’s office. Since my appointment wasn’t until 4:00PM I decided to just hangout in the waiting room for an hour instead of venturing out into the rain to kill time. While sitting there reading my book (“Eat, Pray, Love” by Elizabeth Gilbert), I must have gotten the same three severe weather alerts on my phone 10 times each at least. I am not kidding when I tell you I received an alert every two – three minutes….the exact same messages: severe thunderstorm, flash flood warning, tornado watch. I had been getting said messages for an hour already. Finally try call me back to get my teeth cleaned. Now, I’m not one of those people who hates going to the dentist or gets all worried and bent out of shape. The only thing that really bothers me is the sound of the cleaning instruments against my teeth. To me it sounds like they are destroying my teeth rather than cleaning. And since it has been a really long time since my last appointment and because of all the craziness happening with the weather I was a bit on edge today. Amy had just finished cleaning, scraping and hacking away at my bottom teeth when we heard it. The town tornado sirens going off. This is not a test. Do not panic, this is not a drill. then we overheard one of the other office ladies say her husband text her that he saw the funnel cloud touch down. Well, you don’t have to tell us twice, we were heading to the basement. I didn’t even know my dentist office HAD a basement, but I was thankful for it today! 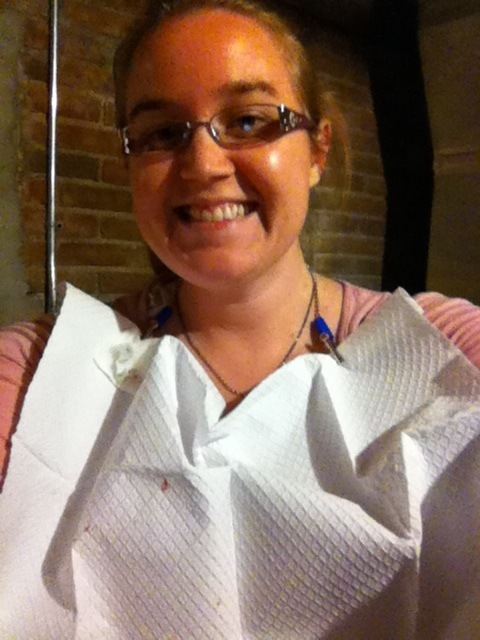 Picture this: two patients, one for a routine cleaning, the other to fix a broken tooth on her birthday of all days, sporting our dentist bibs, each halfway through our appointment in the basement with four dentist assistants. The dentist went outside (I don’t know why!!) to check the sky and when he returned, he brought my dad with him, who had been waiting for me in the car. 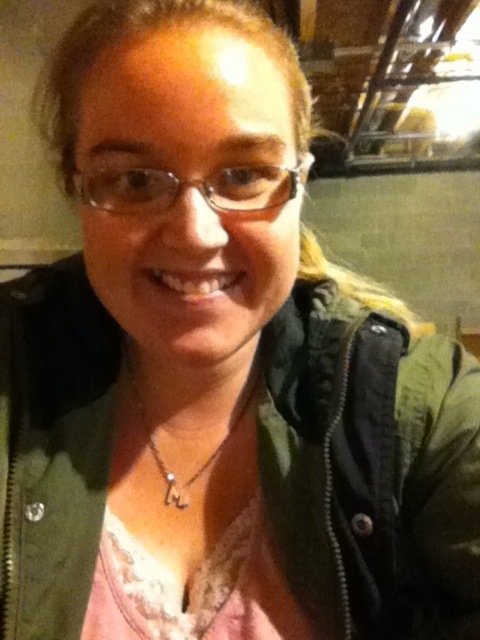 So here I am, half my teeth cleaned, hiding out in the basement…you can’t tell because I’m smiling, but I’m freaking out. Finally, we got the all clear to go back upstairs with the goal of finishing our appointments before the next round hit. I am pleased to say we succeeded….however, as we were about to leave the office to make a break for the car, you’ll never guess why we heard. the tornado sirens….AGAIN!! you know where this is going…back to the dentist’s basement we all go. Just trying to get out of the city took forever!! 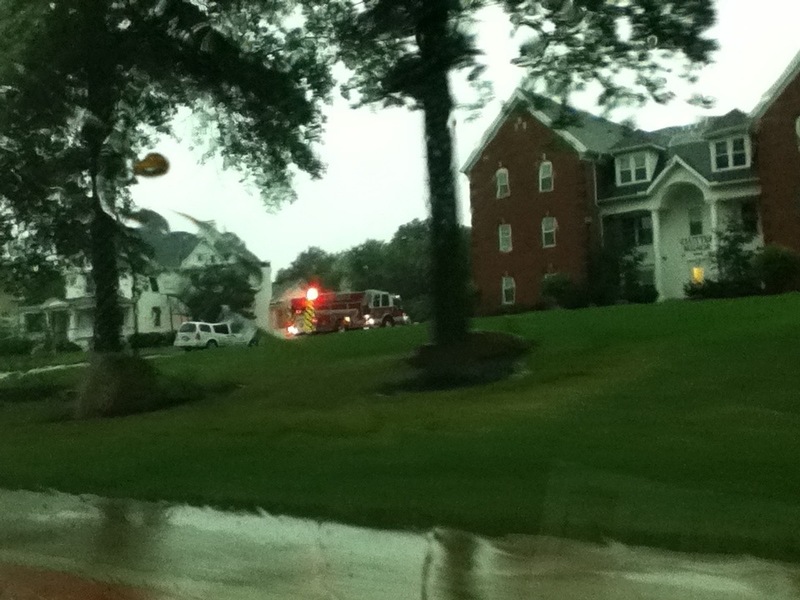 There were emergency personnel everywhere! What would normally take 25 minutes to get home, took nearly an hour tonight. 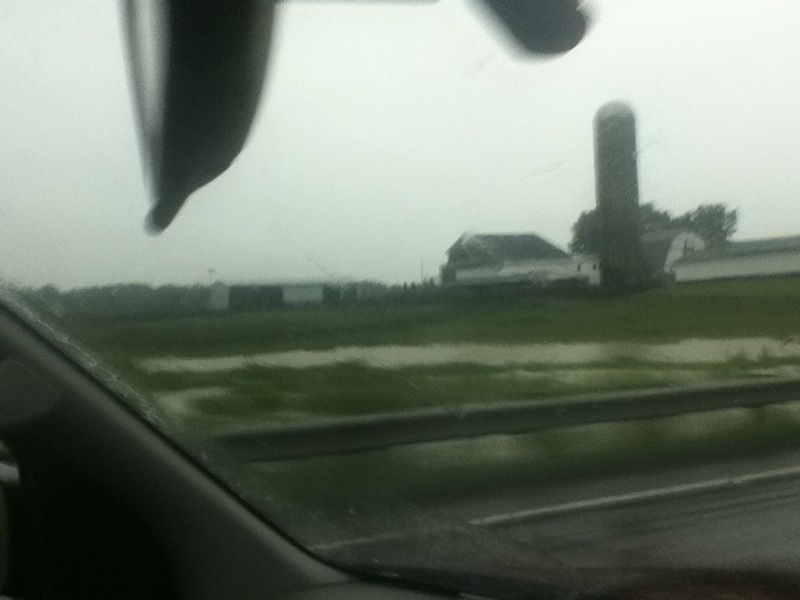 We passed so much flooding. 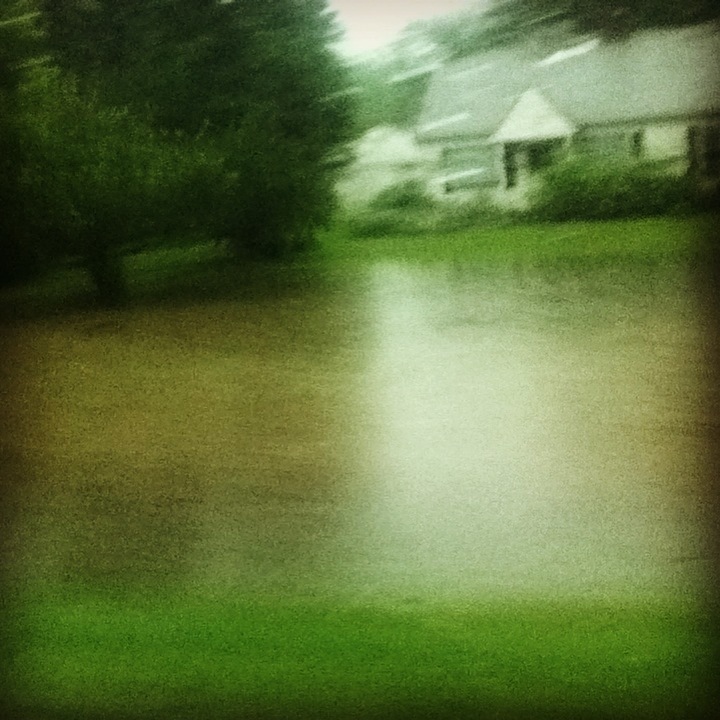 One house was surrounded by water. 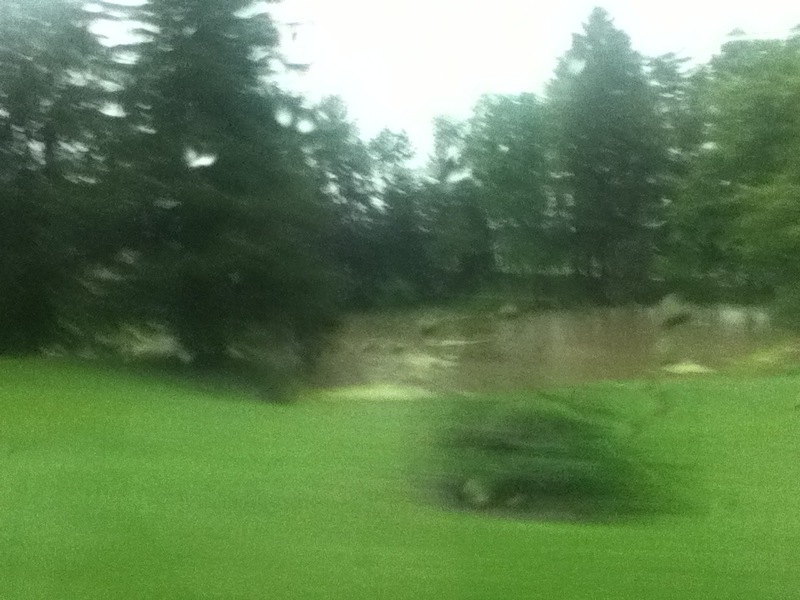 Rivers were overflowing. Fields were drowning. The ground is just so saturated there is nowhere left for the water to go. Imagine a sponge that just can’t hold anymore water, it’s just dripping all over everything, that’s what we are dealing with. 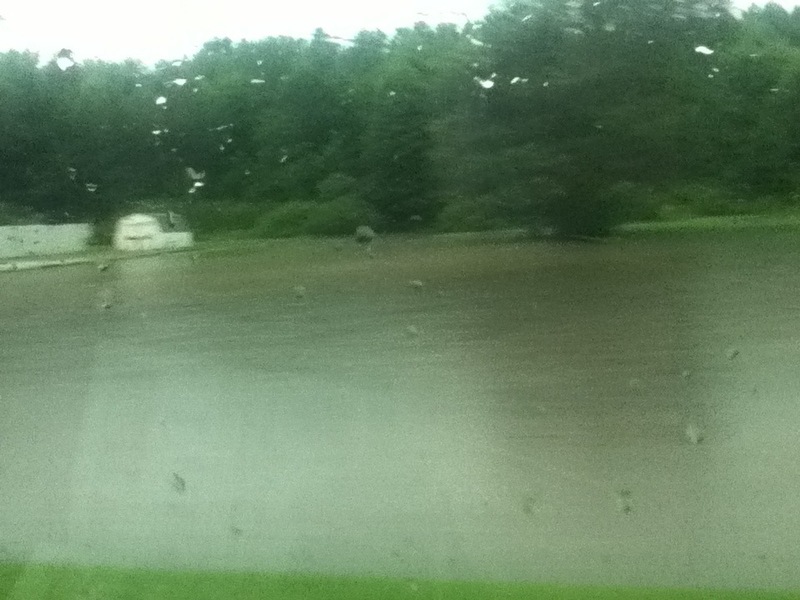 We pass by this house that has a lake in the front yard, today the lake was so full, you couldn’t tell where the grass ended and the lake began…it just looked like one majorly flooded yard. Luckily we made it home in one piece, our yard and driveway surprisingly weren’t flooded and the rest of the evening was uneventful. 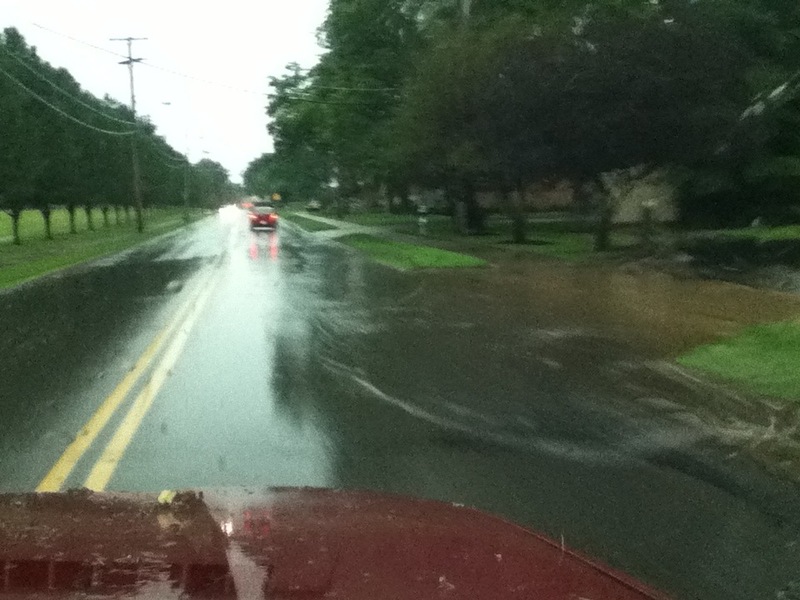 We were suppose to go to my grandparents’ house for my cousin’s birthday dinner tonight, but the festivities have been delayed as both of her parents (her dad is the chief) are on our volunteer fire department and they were out on multiple calls with many roads having to be closed due to flooding. Party has been moved to Thursday night! Next time I got to the dentist, I really hope its boring and nothing to write about because I NEVER want a dentist or any other appointment for that matter, to be that exciting, ever. I hope you had a great day celebrating our Nation’s birthday! Every year on the fourth, my family has a family reunion… you know the kind, family members you see once a year, all kinds of pasta salad and hamburgers, and catching up on the latest family gossip , I mean news. This year, it was HOT!! And not just that, it was muggy and dry. Oh, and I forgot to mention this get-together is held OUTSIDE!! Now, I love my family. As a whole, we are loud, laughing, enjoying life kind of group. And boy can we talk! Some of my family members will just go on and on and on for what seems like days! You almost have to wonder how they can talk so much and so fast and still breathe. It’s a gift, no other explanation. Finally, it got to hot to hang around [heat index over 100] and we went home to wait until it was firework time [sort of]!! We always watch fireworks at the same place every year and we have a certain “spot” that we like to watch from… so we went 2 1/2 HOURS EARLY to get our favorite spot. Okay, I should mention partly we do this to get a free parking spot and also to avoid all the people at the pop-up carnival on the other side of the park. Now, I need to back track for a minute….. all day long, thanks to the extreme heat, we had some MAJOR storms building, and of course when are they suppose to hit? 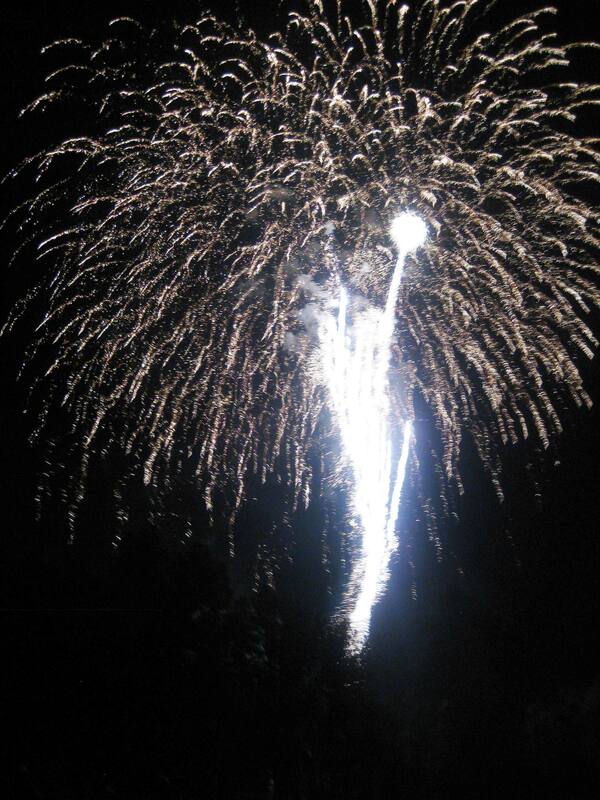 Around the time of the fireworks…. I mean, isn’t that the way it always happens?! So, there we sit, waiting for the show to start and the Queen (aka: mom) gets a text from the King (aka: dad)….. “Thunderstorm building just north of you. Moving fast. Will be there by 10:00pm.” Awesome. And it’s only 9:10pm and the fireworks start at 10:00pm. I am starting to get paranoid. No joke. The girl who use to LOVE thunderstorms, now dreads them thanks to a life changing experience on my last day in Florida, but that is another story. 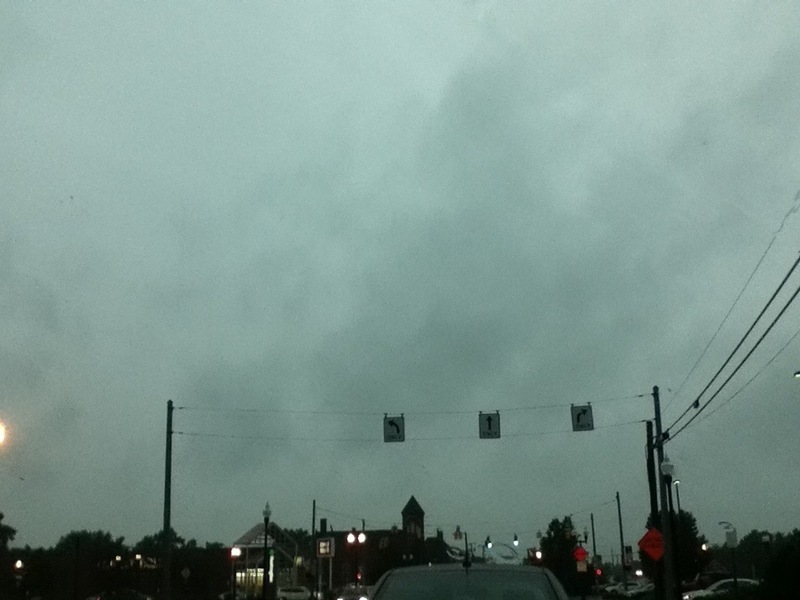 And then I see it….. lightning over yonder by the carnival rides. In what seemed like 1/20 of a second I have packed up my folding lawn chair, stashed away my beloved camera (I’d die if anything happened to it, it really is an extension of my person) and grabbed my bag with the thought that safety lies in getting to the car ASAP. Clearly, my family thinks I have over-reacted. 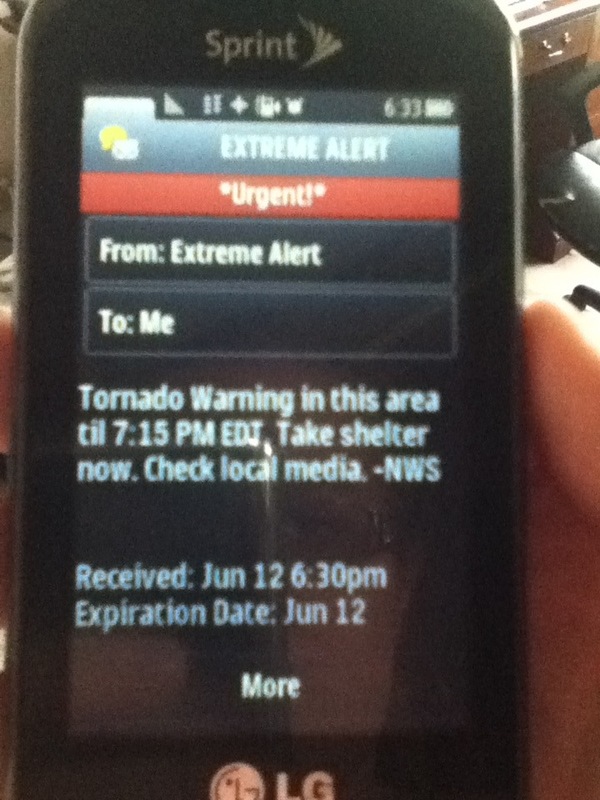 So reluctantly I lay down in the grass, on edge and very stressed out since the next text from the King is something about a tornado warning for our area until midnight. Umm… can we go now, please?! “We’ve waited all year to see fireworks” and “it’ll blow over in no time” and “you worry too much” and “they will start any minute now” float on the wind. I think they did end up starting the show a few minutes early and it’s a good thing they did because that storm must have consumed an energy drink or something because it started booking it double time. I have never seen our local fireworks get set off so fast and I NEVER want to see them during a thunderstorm EVER, EVER AGAIN. But I will admit, when I wasn’t concentrating on fighting my body’s fight or flight response, the grand finale looked kind of sweet with the lightning streaks in the background. And then it was a slow, mad dash back to the car thanks to the torrential downpour. Made all the harder with my sore knee and slippery crocks. What a night. On the bright side, I did get this picture of the fireworks and I think it looks like this NBA logo. What do you think? Can you see it too, or is my brain still water-logged? Answer: Corn. And this year, thanks to the good weather, it’s nearly as high as my shoulder!! I love Sundays! They may be my favorite day of the week! It was a lazy, humid day here in the Kingdom. I finished reading book four in The Kingdom Keepers Series, The Kingdom Keepers – Power Play. It was an AMAZING book and I had a hard time putting it down at night so I could sleep! So… because I HAD TO KNOW what was happening next in the story, I began book five, The Kingdom Keepers – Shell Game. I am going to feel empty on the inside when I finish this book! Does anyone else get so lost in a story that they cry and laugh with the characters, and feel lonely when the book ends?! I’ve always had that problem…. or connection! Now, before you think all I did was read today, I did accomplish 3 loads of laundry! I managed to hang 2 loads outside on the clothes lines. THEY SMELL FANTASTIC NOW, like sunshine and starry nights! It’s the little things of summer that I enjoy! There is nothing as wonderful as falling asleep under sheets and blankets that have soaked in the clean summer air! I am going to sleep so well tonight!